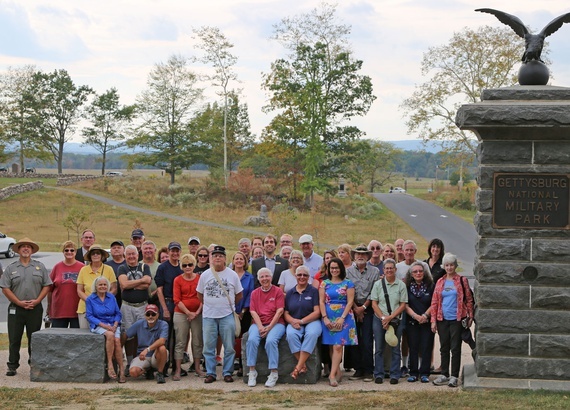 Gettysburg National Military Park and the Gettysburg Foundation held a special ceremony on October 6 to recognize years of joint effort to preserve the iconic Cemetery Ridge on the Gettysburg battlefield. The ceremony marked the end of the Gettysburg Foundation’s role in rehabilitating Cemetery Ridge, its work now completed. Thomas Forsyth, Acting Superintendent at Gettysburg National Military Park and the Eisenhower National Historic Site, presented the Gettysburg Foundation with a certificate in honor of the many contributions of the Friends and/or donors to this project. Gettysburg National Military Park will continue to preserve and upgrade the area in perpetuity.